Both socks are from when I was wearing a lot of odd socks in my boots and was cranking off one of these socks, since they were knit with 4.00 mm on 40 stitches, usually in about 3-4 hours. The grey sock is from 1995 and I am still wearing it regularly. Says something for the quality of the yarn. The second I duplicated a couple of years later, supposedly for one of my daughters, but it never got there. Both colors of sock yarns are from Jawoll. Using one skein of marled and one of solid, 11 rows of stockingette are alternated with five rounds (two ridges) of garter stich. Ribbing, heels and toes are done in the solid yarn. I made up the pattern to make the more expensive multi-colored yarn stretch farther. You have to remember that this is the old days, before any of the fancy printed sock yarns. As you can tell, the yarn came originally in about four colorways and others were added over the years. Once you are past 1999, there were other choices, lots of other choices and I stopped buying the stuff. I may still have a few balls aging in one of the sock yarn boxes. When I was doing boot socks, I used two strands of the yarn together, amazingly able to match up the patterns most of the time. 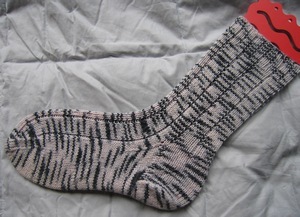 The white sock yarn came from Rödel and the stripe was one of the very early Regia Ringel Colors. Knit from the top down with an after-thought heel. Ok, I did that and will not again. My foot is not shaped like that heel. These were done before we moved from Heidelberg the first time in mid-1997. 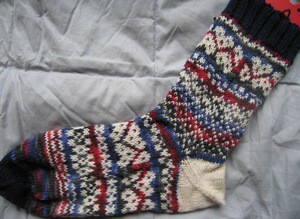 The pattern comes from A Time to knit Stockings. They were done of 72 stitches. As they turned out to be a bit big, they have not been worn overly much. The sock yarn was from Schöllinger and this is just your basic vanilla sock pattern with the leg and foot top knit in a 5kp1 rib with standard German strap heel and routine toe. The sock yarn was from Opal and this is just your basic vanilla sock pattern with standard German strap heel and routine toe. Since it coordinates well with jeans, it has been worn a lot. 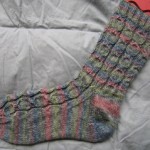 The sock yarn was a pastel striped Fortissima. Since it looked to me the same colors as a bowl of candies, I made up a pattern that took both the round hard candy look and added in the twists of the wrapper. Each column is eight stitches wide, the pattern is 16 stitches wide and there are four repeats making up a 64 stitch diameter. Now all you have to do is add your favorite toe and heel! If you really want a pattern, email me and I will see what I can do. 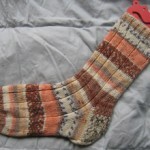 The sock yarn is from Stahl. I bounght this ball and three others out of the eight possible combinations at Herties in München. I was headed to a medical conference at the Sanitätsakademie and wanted to make sure that I was not bored in the evenings. As you can see, again knit in k5p1 rib with a eye of partridge strap heel. The color repeat takes almost 20 cm” on a 60 stitch sock. 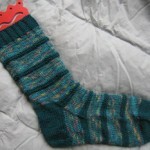 The sock yarn is from Stahl. I bought this ball and three others out of the eight possible combinations at Herties in München. This particular color was accented with glitz in some of the stripes. I am not sure what I did with the pink color combo. I think I knit it, but then bought a second ball which might have made its way to Australia. The toes from both socks are shown. 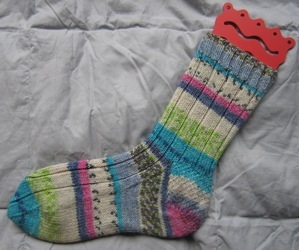 The color repeat takes almost 20 cm” on a 60 stitch sock.